To Cite: Jahani Golbar S, Gharekhanlu R, Kordi M R, Khazani A. Effects of Endurance Exercise Training on Kinesin - 5 and Dynein Motor Proteins in Sciatic Nerves of Male Wistar Rats with Diabetic Neuropathy, Int J Sport Stud Hlth. 2018 ; 1(1):e67758. doi: 10.5812/intjssh.67758. Objectives: Diabetic neuropathy is a type of nerve disorders caused by diabetes which leads to disruptions of axonal transports and exercise can result in its improvement. However, mechanisms and the impact of exercise in these disruptions are not fully understood. So, the purpose of this research is to investigate the effect of endurance exercise on contents of Kinesin - 5 and Dynein motor proteins in sciatic nerves of male Wistar rats with diabetic neuropathy. Methods: A number of Twenty - four male Wistar rats were randomly placed in four groups of six each: diabetes control, diabetes exercise, healthy control, and healthy exercise. Intraperitoneal injection of streptozotocin (STZ, 45 mg/Kg) was used for induction of diabetes. Moderate - endurance exercise protocol was performed for 6 weeks, two weeks after injection of STZ and diabetic neuropathy was proven by mechanical allodynia and thermal hyperalgesia tests. 24 hours after the last training session, the rats were dissected and their sciatic nerves were extracted. The contents of Kinesin - 5 and Dynein motor proteins were examined with enzymatic method (ELISA). Results: Moderate - endurance exercise significantly improves mechanical allodynia and thermal hyperalgesia in rats. A significant correlation was observed between mechanical allodynia and thermal hyperalgesia with resting levels of blood glucose (r = 0.68, p = 0.001, r = 0.82, p = 0.001, respectively). A significant increase was observed in contents of Kinesin - 5 and Dynein motor proteins in diabetes control compared with healthy control and diabetes exercise groups (p < 0.05). A significant increase was obtained in contents of Kinesin - 5 and Dynein motor proteins in healthy exercise group compared to healthy control group (p < 0.05). Conclusions: The results demonstrate that one of the possible factors involved in axonal transport dysfunction in diabetic neuropathy can be STZ induced upregulation of Kinesin - 5 and Dynein motor proteins in diabetic rats. Endurance exercise as a non - medication strategy can moderate the increase. Diabetes is one of the most common metabolic diseases worldwide. It has serious complications such as nephropathy, neuropathy, and retinopathy, as well as cardiovascular problems, gastro - intestinal disorders, immune system impairment and atrophy of skeletal muscle (1). Reduction in capacity of nerve regeneration, among various complications of diabetes disease, is the main factor involved in human and animals with diabetic neuropathy. In addition to permanent changes in diabetic neuropathy, nerve damage stimulates specific changes in damage of neurotropic factors, their receptors, and intracellular signaling pathways associated with altered neuronal functions. However, the mechanisms of these changes have not been fully explained (1). Neuropathy induced by diabetes through different methods and mechanisms leads to destruction patterns in neurons, which initially affects sensory neurons and then motor neurons (or motoneurons) (2). In diabetic neuropathy, along with enhancement in duration and severity of diabetes, sensory impairments usually occur earlier than impairments of motoneurons function and will emerge first in the lower limbs. In general, motoneurons are not considered as the main goal in diabetes disease. Although it is predicted that they are faced with less damages in diabetic neuropathy, it has not been proven in laboratory studies. Reduced motor nerve conduction velocity is one case that confirms this issue. Long - term diabetic neuropathy has also been accompanied by reduced action potential of lower muscle motor combination in human attempts. In addition, non - sustainable neuromuscular connections are reported in these patients. However, this form of motor neurons involvement is much lower (3). Neuronal targeting in diabetic patients has unique features. In particular, targeting and damage of sensory neurons occurs in diabetes before disruption of motor neurons. The pattern of nerve damage observed in diabetes is dying back, and loss of lower axons before complete destruction of nervous tree is a characteristic. The dying back pattern which is reflected in longer axons is caused by impairment in production or onward transfer of essential proteins (3). Studies show that numerous neurodegenerative diseases such as Alzheimers, Charcot - Marie - Tooth, amyotrophic lateral palsy, Huntington, and Parkinsons will arise in case of creation of disruption in Kinesin and Dynein motor proteins (4-7). This is while molecules and various substances such as mitochondria, P75, GAP - 43, Trk A, Trk B, BDNF, Amyloid Precursor Protein (APP), and SNAP25 are transferred onward by these motor proteins in neurons (8). On the other hand, performed studies on rats with diabetic neuropathy show reduction in many of these substances and molecules (4). Conversely, increased activity in the form of regular exercise enhances ductility and antioxidant system and up - regulation of neutrophils and prevents neurons apoptosis (9). Exercise can also be accompanied by RNA biosynthesis, increased axonal transport, and increased neural sprouting followed by nerve cut (10). In contrast, the majority of observed sensory and motor nerves disorders in diabetic neuropathy are attributed to mitochondrial disorders in different parts of neurons, and multiple synaptic deficits (5, 11, 12). With regard to the involvement of neural motor proteins disorder in many of neurodegenerative diseases, it is possible that they also have a role in loss of sensory and motor neurons caused by diabetic neuropathy disease. On the other hand, Exercise as a non - pharmacological approach, has had beneficial effects on the motor proteins. Given the sensory and motor neurons disorders in diabetic neuropathy, the effect of endurance exercise on contents of Kinesin - 5 and Dynein motor proteins in sciatic nerves of male Wistar rats with diabetic neuropathy will be discussed in this research. A total of 24 adult male Wistar rats, weighing 271.3 ± 11.2 g, and 10 weeks old were prepared from department of production & breeding of animals’ laboratory, Razi research institute and transferred to animals’ laboratory of Tarbiat Modarres University. All rats were kept in controlled environmental conditions with an average temperature of 22 ± 3 ˚C, 12:12 dark/light cycles. All the ethics of working with animals were examined and approved by ethics committee of Tarbiat Modarres University. After two weeks of orientation and animals’ adaptation to the new environment and achieving to optimal weight of 326.3 ± 8.4 g (2), the rats were randomly devided into four groups of six each: group I (diabetes control), group II (diabetes exercise), group III (healthy control), and group IV (healthy exercise). Neuropathic pain behavioral testing was conducted as an indicator of performance of sensory neurons, two weeks after induction of diabetes (2) and after ensuring sensory neuropathy had been obtained in rats (13), a 6 - week endurance exercise protocol was performed (14). At first, during the orientation phase and in order to habituate to laboratory conditions (treadmill and manipulation exercises), the animals were given exercise on a treadmill, 5 days a week for 10 - 15 minutes at a speed of 10 m/min. The rats were exposed to behavioral testing for 3 days (2 times for each testing) for adaptation to behavioral tests (15). 2 weeks after induction of diabetes and by re - running pain behavioral tests, as well as ensuring incidence of neuropathic pain in diabetic groups, the endurance exercise protocol was then carried out for 6 weeks (14). All training sessions were held at the end of sleep cycle of the rats and during 4 - 6 p.m. Behavioral tests were also conducted between 7 a.m and 10 a.m, to avoid meddler or confounding factors such as stress - induced antinociception (15). After passing 12 hours of food deprivation, STZ solution (45 mg/Kg dissolved in fresh citrate buffer 0.5 mol/L, pH 4.5; Sigma, St. Louis, MO) was intraperitoneally injected for induction of diabetes. The non - diabetic rats also received an equivalent volume of citrate buffer. After passing of 48 hours from the injection and without fasting conditions, measured blood drops were obtained with a small injury by lancet on rats’ tail veins. A glucometer strip was used o drop of blood was then placed on. The strip was read by a glucometer device (Glucotrend 2, Roche Company, and Germany). The rats with blood glucose levels higher than 300 mg/dL were considered as diabetic (2). Mechanical allodynia and thermal hyperalgesia tests were used for investigation of diabetic neuropathy. Von Fery (USA Stoelting) different filaments in the range of 2 to 60 g were used for measurement of mechanical allodynia to determine sensitivity of skin to contact stimulates. Each test was started by filament with minimum weight and filaments with higher weight were used in the lack of response to minimum weight filaments. In the case that response (lift of foot by animal) was observed 2 consecutive times, the same weight was considered as Paw Withdrawal Threshold (PWT), and the test was finished. In the case that the animals did not respond to any of the filaments, such as the filament number 60, then 60 was considered as the threshold response. Each test was performed 3 times at intervals of at least 3 minutes. Their mean number was considered as Paw Withdrawal Threshold. Mechanical allodynia measurement before administration of STZ was conducted 14 days after injection. Thermal hyperalgesia was measured by the modified method of Hargreaves et al. (1988) (13). The training was performed with intensity of 60-70% of maximal oxygen uptake (14). The exercise group performed endurance exercise with moderate-intensity of treadmill exercises in a 5 - session program in a week for 6 weeks. Speed and duration of treadmill exercise was gradually increased from 10 m/min for 10 minutes in the first week, 10 m/min for 20 minutes in the second week, 14 - 15 m/min for 20 minutes in the third week, 14 - 15 m/min for 30 minutes in the fourth week, to 17 - 18 m/min for 30 minutes in the fifth week. All exercise variables in the final week (the sixth week) were kept constant in order for the obtained adaptations to reach to steady state conditions (15). The rats were anesthetized by intraperitoneal injection of ketamine (90 mg/Kg) and xylazine (10 mg/Kg), 24 hours after the last exercise session. The sciatic nerves were isolated from certain parts with equal size. They were then frozen in liquid nitrogen at -80 ˚C and kept for further analysis (16). The tissues in Nonidet P - 40 (NP - 40) buffer (containing Tris, Triton × 100 and NaCl), with cocktail inhibitors were homogenized by electrical homogenizer and the concentration of total protein was measured by Bradford method. The amount of Dynein and Kinesin - 5 (KIF5B) was measured by enzymatic method (ELISA), using CUSABIO kit (catalog number CSB - EL007292RA) and Life Science kit (catalog number E95507RA), respectively. Kolmogorov–Smirnov test was used to determine the quality of data. Two - way ANOVA, One - way ANOVA, and Post Hoc Scheffe Tests were used to determine significance of difference between variables and their interaction. A significance level (P ≤ 0.05) was determined for investigation of hypothesis tests and to decide whether to accept or reject the hypothesis. All statistics procedures were performed using SPSS version 17. Blood glucose levels in diabetic groups were significantly higher than in healthy group (p = 0.0001) at the beginning of the exercise program, this significant difference still existed after 6 weeks of endurance exercises (p = 0.0001). Blood glucose levels in diabetes exercise group were significantly lower than in diabetes control group (p = 0.0001) at the end of the exercise program (Table 1). Initial weight of rats in different groups did not have significant difference (p = 0.07). However at the end of study, the mean of body weight changes in diabetes control and diabetes exercise groups was significantly lower than healthy control (p = 0.0001 and p = 0.001, respectively). The mean of body weight in diabetes exercise group was significantly lower than diabetes control (p = 0.04) (See Table 1). bSignificant difference with Healthy Control group (p < 0.01). 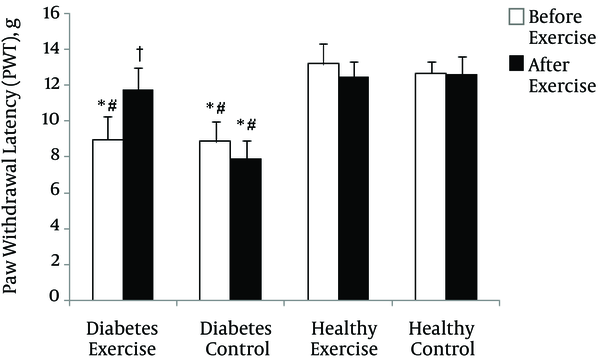 cSignificant difference with Healthy Exercise group (p < 0.01). dSignificant difference with Diabetes Control group (p < 0.01). The mean change in Paw Withdrawal Latency (PWL) in thermal hyperalgesia test and before beginning of exercise program (two weeks after induction of diabetes) in diabetes groups was significantly lower than healthy groups (p = 0.0001). After exercise program, only the mean change of diabetes control was significantly lower than the other groups (p = 0.0001) (See Figure 1). The mean change of Paw Withdrawal Threshold (PWT) in mechanical allodynia test before beginning of exercise program (two weeks after induction of diabetes) in diabetes groups was significantly lower than healthy groups (p = 0.0001). 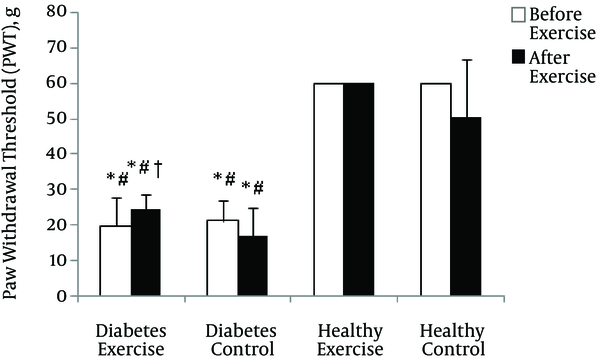 After exercise program, although the mean change of diabetes exercise was significantly lower than the healthy groups (p = 0.001), it was significantly higher compared with diabetes control (p = 0.04) (See Figure 2). All rats in exercise groups were able to consistently perform 6 weeks of endurance exercises. The results of Two - way Analysis of Variance (diabetes × exercise) showed a significant effect of interaction in the amount changes of Kinesin - 5 and Dynein motor proteins (p = 0.00 and p = 0.02, respectively) (Table 2). The results suggested a significant increase in the contents of Kinesin - 5 and Dynein motor proteins in diabetes control compared with healthy control and diabetes exercise (Kinesin - 5: p = 0.001 and p = 0.001; Dynein: p = 0.04 and p = 0.001, respectively); also, a significant increase in the contents of Kinesin - 5 and Dynein motor proteins healthy exercise was obtained compared with healthy control (p = 0.01 and p = 0.02) (See Table 2). bSignificant difference with Diabetes Control group (p < 0.05). cSignificant difference with Healthy Control group (p < 0.05). The neuropathic pain model of systemic injection of STZ was performed in this study to investigate chronic effects of increased activity in the form of endurance exercise on behavioral response of neuropathic pain. The obtained results from this study showed that increased activity in the form of moderate endurance exercise can improve neuropathic pain responses in mechanical allodynia and thermal hyperalgesia. This result is consistent with some studies suggesting the significant effects of exercise training on neuropathic pain responses in various pain models (11, 15). Conversely, some studies have failed to confirm the effects of exercise training on improvement of neuropathic pain (17). The reason for the difference could be due to difference in type of pain creation model (15, 17). The present study showed that moderate intensity exercise training caused a significant reduction in blood glucose levels in diabetes exercise group. Since muscles are the most common place for consumption of resting metabolic fuel, the increased muscular activity during aerobic exercise increases fuel requirements. Therefore, the factor that affects the reduction of blood glucose levels, also improves pain behavioral responses. The results suggested that diabetes could result in the increase of Kinesin - 5 and Dynein proteins in sciatic nerves of diabetic rats which is in consistent with studies showing that axonal transport motor proteins in other neurodegenerative diseases such as Alzheimers, Charcot - Marie - Tooth, amyotrophic lateral palsy, Huntington, and Parkinsons are subject to change (7). Studies showed many molecular disorders such as down regulation of mRNA, structural proteins such as neurofilaments and tubulin subunits, and other proteins such as GAP - 43, Trk A, CGRP in sensory neurons of STZ - diabetic rats (16, 18). On the other hand, onward axonal transport NT - 3, BDNF, AND p75NTR is reduced in diabetic rats (4, 8). So it seems that the amount of motor proteins is faced with down-regulation in these conditions on contrary with the findings of this research. So, here we are faced with a fundamental question: why does expression of motor proteins increase in diabetic neuropathy conditions? The results of a study performed by Baptista et al. (2013) showed that diabetes leads to increase in expression and amount of Kinesin and Dynein in hippocampus of the rats. The researchers, based on the fact that hyperglycemia is a major factor in complications of diabetes, and in relation to cause of enhancement of the motor proteins, examined kinetics and the number of the proteins in hippocampal neurons in vitro and in conditions of high levels of glucose. The results suggested that endurance exercise prevents increase in contents of Kinesin - 5 and Dynein motor proteins in sciatic nerves with diabetic neuropathy. In line with the results, Molten et al. (2004) showed that voluntary running on enhances nerve regeneration in sensory neurons after sciatic nerve damage. They attributed increase of sensory neurons regeneration to increase in expression of synapsin I, NT - 3, BDNF, and GAP - 43 (19). It seems that neurons in response to increased activity in the form of endurance exercise, act in a rational and efficient method. Another problem is the reason for increase of the motor proteins in pathologic conditions of diabetic neuropathy. The pattern of nerve destruction in diabetes disease is as dying back model that is characterized by loss of lower axons before complete destruction of nervous tree. The dying back model is induced by production or onward transport of essential proteins that are characterized in longer axons. According to the results of this study, based on increase of axonal motor proteins contents due to diabetes, as well as endurance exercise and performed studies on axonal abnormalities in other neurodegenerative diseases, a new possible hypothesis in the field of axonal transport and neuronal degenerative disease can be presented by the name of Cargo & Driver Theory (3). The present study generally shows that moderate - endurance exercise can have chronic effects on improvement of neuropathic pain. So, this research suggests that one of the possible factors involved in dysfunctional axonal transport in diabetic neuropathy, is due to the increase of Kinesin - 5 and Dynein motor proteins’ contents in sciatic nerves of diabetic rats. Conclusively, Endurance exercise can be considered as a non - pharmacological strategy for neuropathic pain. 1. Edwards JL, Vincent AM, Cheng HT, Feldman EL. Diabetic neuropathy: mechanisms to management. Pharmacol Ther. 2008;120(1):1-34. doi: 10.1016/j.pharmthera.2008.05.005. [PubMed: 18616962]. 2. Calcutt NA. Modeling Diabetic Sensory Neuropathy in Rats. Methods Mol. Med. 2004;99:55-66. doi: 10.1385/1-59259-770-x:055. 3. Zochodne DW, Ramji N, Toth C. Neuronal targeting in diabetes mellitus: a story of sensory neurons and motor neurons. Neuroscientist. 2008;14(4):311-8. doi: 10.1177/1073858408316175. [PubMed: 18660461]. 4. Fernyhough P, Diemel LT, Tomlinson DR. Target tissue production and axonal transport of neurotrophin-3 are reduced in streptozotocin-diabetic rats. Diabetologia. 1998;41(3):300-6. doi: 10.1007/s001250050907. [PubMed: 9541170]. 5. Perlson E, Maday S, Fu MM, Moughamian AJ, Holzbaur EL. Retrograde axonal transport: pathways to cell death?. Trends Neurosci. 2010;33(7):335-44. doi: 10.1016/j.tins.2010.03.006. [PubMed: 20434225]. 6. Maday S, Twelvetrees AE, Moughamian AJ, Holzbaur EL. Axonal transport: cargo-specific mechanisms of motility and regulation. Neuron. 2014;84(2):292-309. doi: 10.1016/j.neuron.2014.10.019. [PubMed: 25374356]. 7. O' Neill C . PI3-kinase/Akt/mTOR signaling: impaired on/off switches in aging, cognitive decline and Alzheimer's disease. Exp Gerontol. 2013;48(7):647-53. doi: 10.1016/j.exger.2013.02.025. [PubMed: 23470275]. 8. Dobretsov M, Romanovsky D, Stimers JR. Early diabetic neuropathy: triggers and mechanisms. World J Gastroenterol. 2007;13(2):175-91. [PubMed: 17226897]. 9. Cotman CW, Berchtold NC. Exercise: a behavioral intervention to enhance brain health and plasticity. Trends Neurosci. 2002;25(6):295-301. [PubMed: 12086747]. 10. Gerchman LB, Edgerton VR, Carrow RE. Effects of physical training on the histochemistry and morphology of ventral motor neurons. Exp Neurol. 1975;49(3):790-801. [PubMed: 1204705]. 11. Chen YW, Li YT, Chen YC, Li ZY, Hung CH. Exercise training attenuates neuropathic pain and cytokine expression after chronic constriction injury of rat sciatic nerve. Anesth Analg. 2012;114(6):1330-7. doi: 10.1213/ANE.0b013e31824c4ed4. [PubMed: 22415536]. 12. Kami K, Tajima F, Senba E. Exercise-induced hypoalgesia: potential mechanisms in animal models of neuropathic pain. Anat Sci Int. 2017;92(1):79-90. doi: 10.1007/s12565-016-0360-z. [PubMed: 27484434]. 13. Hargreaves K, Dubner R, Brown F, Flores C, Joris J. A new and sensitive method for measuring thermal nociception in cutaneous hyperalgesia. Pain. 1988;32(1):77-88. [PubMed: 3340425]. 14. Chae CH, Kim HT. Forced, moderate-intensity treadmill exercise suppresses apoptosis by increasing the level of NGF and stimulating phosphatidylinositol 3-kinase signaling in the hippocampus of induced aging rats. Neurochem Int. 2009;55(4):208-13. doi: 10.1016/j.neuint.2009.02.024. [PubMed: 19524110]. 15. Sharma NK, Ryals JM, Gajewski BJ, Wright DE. Aerobic exercise alters analgesia and neurotrophin-3 synthesis in an animal model of chronic widespread pain. Phys Ther. 2010;90(5):714-25. doi: 10.2522/ptj.20090168. [PubMed: 20338916]. 16. Rahmati M, Khazani A, Gharakhanlou R, Movaheddin M, Manaheji H. Chronic effects of moderate intensity endurance training on neuropathic pain symptoms in diabetic rats. Physiology and Pharmacology. 2013;16(4):435-45. 17. Mazzardo-Martins L, Martins DF, Marcon R, Dos Santos UD, Speckhann B, Gadotti VM, et al. High-intensity extended swimming exercise reduces pain-related behavior in mice: involvement of endogenous opioids and the serotonergic system. J Pain. 2010;11(12):1384-93. doi: 10.1016/j.jpain.2010.03.015. [PubMed: 20488763]. 18. Nassis GP, Papantakou K, Skenderi K, Triandafillopoulou M, Kavouras SA, Yannakoulia M, et al. Aerobic exercise training improves insulin sensitivity without changes in body weight, body fat, adiponectin, and inflammatory markers in overweight and obese girls. Metabolism. 2005;54(11):1472-9. doi: 10.1016/j.metabol.2005.05.013. [PubMed: 16253636]. 19. Molteni R, Zheng JQ, Ying Z, Gomez-Pinilla F, Twiss JL. Voluntary exercise increases axonal regeneration from sensory neurons. Proc Natl Acad Sci U S A. 2004;101(22):8473-8. doi: 10.1073/pnas.0401443101. [PubMed: 15159540].